lower division clerk(HR/Accountant) should have completed degree or its equivalent qualification from a recognized university. For MAHAGENCO LDC jobs the exam or interview will be conducted. 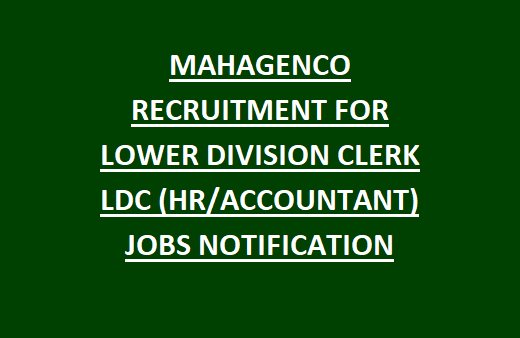 The age limit to apply for lower division clerk (HR/Account) is 18 to 38 years as on 03/10/2017.The last date for submission of application is 03-10-2017 for this LDC recruitment of MAHAGENCO. For more details, see below given information. Age limits are 18 to 38 years as on 28/09/2017.Age relaxations will be applicable bas per the rules. The candidates should completed degree or its equivalent qualification from a recognized university the candidates should selected for exam by written test or by interview process .For interview the candidates should bring their original certificates. The interested candidates should fill their application by online on or before 3/10/2017. Online application are accepted through the official website of www.mahagenco.in.